Cotton’s story illustrates, in many respects, the old adage “The more things change, the more they remain the same.” In each generation, new tactics have been used for achieving the same goals—goals shared by the Founding Fathers. Denying African Americans citizenship was deemed essential to the formation of the original union. Hundreds of years later, America is still not an egalitarian democracy. The arguments and rationalizations that have been trotted out in support of racial exclusion and discrimination in its various forms have changed and evolved, but the outcome has remained largely the same. An extraordinary percentage of black men in the United States are legally barred from voting today, just as they have been throughout most of American history. They are also subject to legalized discrimination in employment, housing, education, public benefits, and jury service, just as their parents, grandparents, and great-grandparents once were. What has changed since the collapse of Jim Crow has less to do with the basic structure of our society than with the language we use to justify it. In the era of colorblindness, it is no longer socially permissible to use race, explicitly, as a justification for discrimination, exclusion, and social contempt. So we don’t. Rather than rely on race, we use our criminal justice system to label people of color “criminals” and then engage in all the practices we supposedly left behind. Today it is perfectly legal to discriminate against criminals in nearly all the ways that it was once legal to discriminate against African Americans. Once you’re labeled a felon, the old forms of discrimination—employment discrimination, housing discrimination, denial of the right to vote, denial of educational opportunity, denial of food stamps and other public benefits, and exclusion from jury service—are suddenly legal. As a criminal, you have scarcely more rights, and arguably less respect, than a black man living in Alabama at the height of Jim Crow. We have not ended racial caste in America; we have merely redesigned it. I reached the conclusions presented in this book reluctantly. Ten years ago, I would have argued strenuously against the central claim made here—namely, that something akin to a racial caste system currently exists in the United States. Indeed, if Barack Obama had been elected president back then, I would have argued that his election marked the nation’s triumph over racial caste—the final nail in the coffin of Jim Crow. My elation would have been tempered by the distance yet to be traveled to reach the promised land of racial justice in America, but my conviction that nothing remotely similar to Jim Crow exists in this country would have been steadfast. Today my elation over Obama’s election is tempered by a far more sobering awareness. As an African American woman, with three young children who will never know a world in which a black man could not be president of the United States, I was beyond thrilled on election night. Yet when I walked out of the election night party, full of hope and enthusiasm, I was immediately reminded of the harsh realities of the New Jim Crow. A black man was on his knees in the gutter, hands cuffed behind his back, as several police officers stood around him talking, joking, and ignoring his human existence. People poured out of the building; many stared for a moment at the black man cowering in the street, and then averted their gaze. What did the election of Barack Obama mean for him? Like many civil rights lawyers, I was inspired to attend law school by the civil rights victories of the 1950s and 1960s. Even in the face of growing social and political opposition to remedial policies such as affirmative action, I clung to the notion that the evils of Jim Crow are behind us and that, while we have a long way to go to fulfill the dream of an egalitarian, multiracial democracy, we have made real progress and are now struggling to hold on to the gains of the past. I thought my job as a civil rights lawyer was to join with the allies of racial progress to resist attacks on affirmative action and to eliminate the vestiges of Jim Crow segregation, including our still separate and unequal system of education. I understood the problems plaguing poor communities of color, including problems associated with crime and rising incarceration rates, to be a function of poverty and lack of access to quality education—the continuing legacy of slavery and Jim Crow. Never did I seriously consider the possibility that a new racial caste system was operating in this country. The new system had been developed and implemented swiftly, and it was largely invisible, even to people, like me, who spent most of their waking hours fighting for justice. I first encountered the idea of a new racial caste system more than a decade ago, when a bright orange poster caught my eye. I was rushing to catch the bus, and I noticed a sign stapled to a telephone pole that screamed in large bold print: The Drug War Is the New Jim Crow. I paused for a moment and skimmed the text of the flyer. Some radical group was holding a community meeting about police brutality, the new three-strikes law in California, and the expansion of America’s prison system. The meeting was being held at a small community church a few blocks away; it had seating capacity for no more than fifty people. I sighed, and muttered to myself something like, “Yeah, the criminal justice system is racist in many ways, but it really doesn’t help to make such an absurd comparison. People will just think you’re crazy.” I then crossed the street and hopped on the bus. I was headed to my new job, director of the Racial Justice Project of the American Civil Liberties Union (ACLU) in Northern California. When I began my work at the ACLU, I assumed that the criminal justice system had problems of racial bias, much in the same way that all major institutions in our society are plagued with problems associated with conscious and unconscious bias. As a lawyer who had litigated numerous class-action employment-discrimination cases, I understood well the many ways in which racial stereotyping can permeate subjective decision-making processes at all levels of an organization, with devastating consequences. I was familiar with the challenges associated with reforming institutions in which racial stratification is thought to be normal—the natural consequence of differences in education, culture, motivation, and, some still believe, innate ability. While at the ACLU, I shifted my focus from employment discrimination to criminal justice reform and dedicated myself to the task of working with others to identify and eliminate racial bias whenever and wherever it reared its ugly head. By the time I left the ACLU, I had come to suspect that I was wrong about the criminal justice system. It was not just another institution infected with racial bias but rather a different beast entirely. The activists who posted the sign on the telephone pole were not crazy; nor were the smattering of lawyers and advocates around the country who were beginning to connect the dots between our current system of mass incarceration and earlier forms of social control. 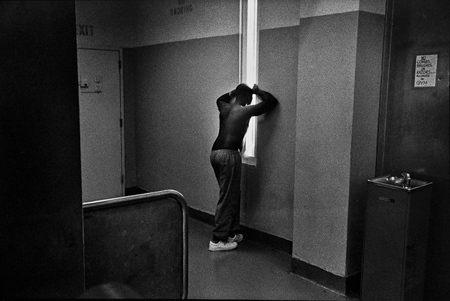 Quite belatedly, I came to see that mass incarceration in the United States had, in fact, emerged as a stunningly comprehensive and well-disguised system of racialized social control that functions in a manner strikingly similar to Jim Crow.